Phill-Air offers you the opportunity to learn to fly in a fast-paced environment at Dover's premier airport, Delaware Air Park. We adapt to your schedule and availability. We are your resource for quality flight instruction at reasonable prices in well-maintained airplane. Move forward to achieve your aviation goal: fly for business, pleasure, or to become an Airline Pilot. Many of our pilots are flying for the military,commuters, instructing other pilots or just flying for the fun and excitement of flying. 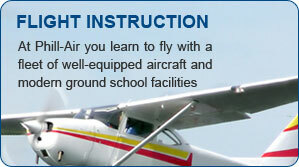 We hold all of the ground school classes at our facility , located 5 miles north of downtown Dover. We can train you from your private pilot certificate all the way through your instrument, commercial, multiengine, and CFI ratings. Feel free to stop by and say "Hi" or talk to our instructors and friends. We're here for you 7 days a week. Our courteous and professional staff will help you with your needs for instruction, rentals, supplies, or just recreational flights.